14K White or Yellow Gold Diamond Flex Ring.1.82 ct of diamonds. An incredible diamond flex ring! It is created in your choice of polished 14K white or yellow gold and features seven fully cut round diamond in four-prong setting surrounded by 56 fully cut round diamonds in prong settings. The total diamond weight is approximately 1.82ct (color: G-H, clarity: SI). 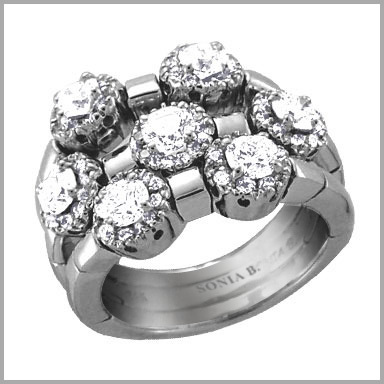 The setting size is 5/8" x 13/16" with a height of 3/16"
Thank you so much Sonia this is the most Spectacular ring that I have ever seen. The diamonds are so sparkly and bright!! Ladies if you want to wow yourself and other buy this ring you will not be disappointed. This is my new right hand ring!! Merry Christmas to me!! 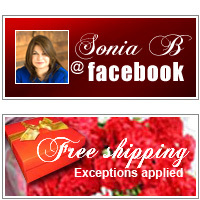 Thank you Sonia for your endless creations!! !